Julie Smith is responsible for the oversight and strategy of Bozzuto’s Marketing, Human Resources, Technology and Research departments. Julie’s expertise in brand building, talent and technology is integral in the company’s ongoing expansion efforts into targeted markets as well as in the alignment of the Bozzuto brand with the evolving expectations of today’s customer. 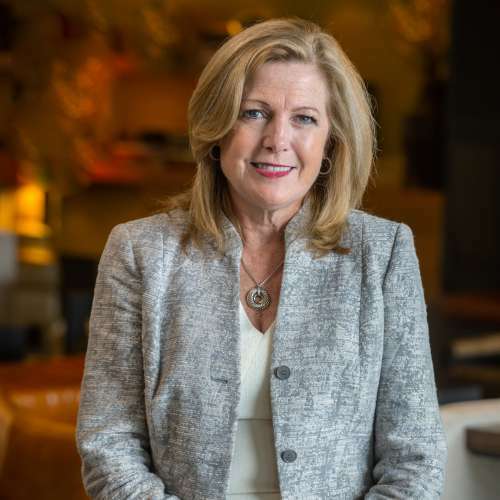 Previously, Julie served as president of Bozzuto Management Company, overseeing a $9 billion portfolio that included more than 50,000 units in more than 200 apartment communities throughout the Northeast, Mid-Atlantic, Midwest and Southern regions. Under Julie’s leadership, Bozzuto Management grew from an organization with 15 employees to one of more than 2,000. It was also named Property Management Firm of the Year by Multi-Housing News in 2011, and now three times by the National Association of Home Builders in 2000, 2009 and 2017. In 2016, Julie was honored as a Distinguished Leader by the Commercial Real Estate Women (CREW) Network. In 2015, Julie was named one of Washington’s Women of Influence by the Washington Business Journal as well as one of The Top Ten Most Influential Women in Multifamily by Multifamily Executive Magazine. She was also named the magazine’s 2013 Multifamily Executive of the Year. Julie serves on the board of Victory Housing and is an Advisory Board Member for the Master in Real Estate Development (MRED) program at The University of Maryland. She chairs the Diversity Committee for the National Multifamily Housing Council and is a past Chair of the Women’s Leadership Initiative for ULI Washington, D.C.